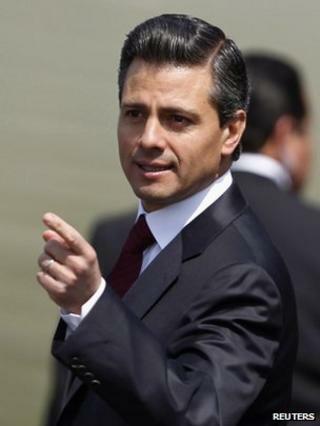 Enrique Pena Nieto won the 2012 Mexican presidential election, returning to power the Institutional Revolutionary Party (PRI), which dominated Mexican politics for much of the 20th Century. During his election campaign, the 46-year-old promised to reform the PRI, which during its seven decades in power had become involved in corruption and patronage. He beat left-wing politician Manuel Lopez Obrador and centre-right candidate Josefina Vazquez Mota to the presidential post. Having joined the PRI at the age of 18, Mr Pena Nieto first came to political prominence in 2005 as the governor of the state of Mexico. He laid out more than 600 tasks which he pledged to carry out during his time as governor, signing them before a notary to convince voters he was serious about his commitment. The promises ranged from building new highways to improving the fresh water supply to the state. When opposition politicians questioned his effectiveness in carrying out the promised tasks, Mr Pena Nieto published a list of all the projects he said he had successfully tackled, complete with costings and the number of people he said they had benefited. Upon becoming president, Mr Pena Nieto again made a list of his priorities, laying them out in his first speech after taking office on 1 December, 2012. With 70,000 people estimated to have died in drug-related violence in Mexico over the past six years, it comes as little surprise that Mr Pena Nieto's top three aims should be centred around decreasing the crime and murder rate and curbing the influence of Mexico's powerful drug cartels. Mr Pena Nieto promised to promote a crime prevention programme, a law aimed at protecting victims of crime, and said he would push through a unified penal code for all of Mexico to avoid having different statutes in different Mexican states. He also said he would ensure police investigations would be carried out according to the letter of the law after the Mexican Supreme Court released jailed Frenchwoman Florence Cassez, the judges arguing her case had been full of irregularities. Six weeks into his mandate, he also announced the creation of a new national police force. While increased security has clearly been his main priority, President Pena Nieto has also pushed through changes in other areas. In February, he signed into law a major reform of the education system, aimed at dismantling some of the power the teachers' union and its long-time leader Elba Esther Gordillo held. A day after the new law was enacted, police arrested Ms Gordillo on suspicion of misappropriating union funds, further weakening her influence. His opponents accuse Mr Pena Nieto of being a man without ideology, who jumps on whatever bandwagon suits him and his party at the time. They say he used his good looks and charm, and that of his former soap opera star wife, to get to the top of the political system. But his supporters argue that he would not have been able to push through the reforms he has if he lacked political acumen and conviction.